This Talon Claw Neck Knife is the trusty friend that always has your back in a tight situation! It features a 3 3/8 in. blade with a black non-glare coating and ABS handle scales. This neck knife includes a black chain lanyard and hard ABS sheath with clip. Use as a necklace sheath or mount it on your belt. 5 3/8 in. overall. 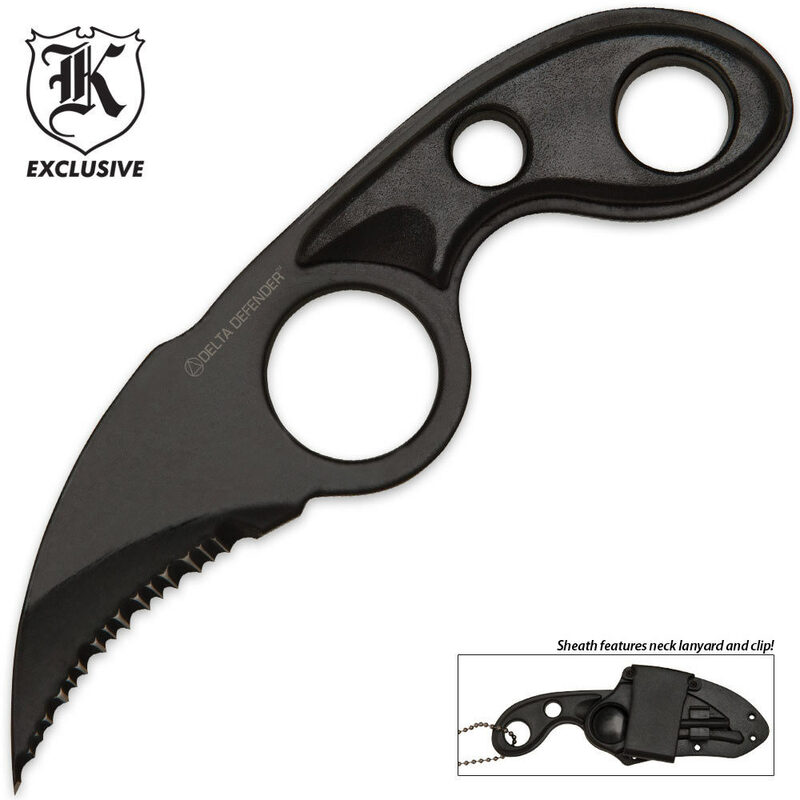 This is a Karambit knife that is not meant for your average use! The knife is primarily is for concealed self defense not for your common outdoor knife & you can put it on a sturdier neck tie if needed! Always learn your tools before purchasing then it won't surprise or upset you when you think it's meant to hack down brush! This knife is really bad, got it the first day tip broke off and the sheath broke to, not good at all. Could not be more satisfied with the Dark Defender Karambit Knife. I usually do not wear it around my neck but on my waste, concealed. I would recommend to any friend. When deciding on a carrying position I couldn't get over how comfortable the handle already was. It took me a few days but then I finally figured out why... The handle feels a lot like the handle to my American Arms mini revolver, which I had as one of my backups when I was a police officer. All in all worth what I paid. As was noted below, design flaws in the chain and the sheath limit it's usefulness as a truly functional neck knife. To clarify one misconception below, that peg near the belt clip is a badge holder for law enforcement or concealed carry weapon permit holders. I got this for self defense. It wears well around the neck and is concealed. As a bonus it works well opening sealed boxes which is a part of my work. Got 2 for the price of one so the other will go on my wall collection. Where do I begin... Knife is OK but very dull and with serrated edge, hard to sharpen, like the feel though, has a bit of jimping on the back but very smooth and almost non existing. Neck chain is stout but won't fit through holes on sheath so if you are wearing as a neck knife, you will pull off the sheath and the knife will be on a chain around your neck???? Sheath has an unusual design and can't figure out why they went this route, it's for left handers number one then there is a peg on the inside near belt loop which I guess is for traction so it won't pull along with the knife when you try and draw it but doesn't work well, again the holes are too small for chain just an all around poor design for sheath. Value is commensurate to the price you pay. Great little knife, I sharpened it up and put a clip on the sheath to hang from the neck and I love it. Removed the belt clip. Pop riveted holes and ready to defend. I bought this knife a few months ago. I really like it but haven't used it that much. I'm still trying to figure out what the little removable attachment is on the back of the sheath is. It's in the lower picture in the display and close to the point end of the sheath. It slides out / off, but I don't know what it does. Also the holes in the sheath need to be drilled out better to accept the dog-tag neck chain that comes with it. It's not practical to wear with the chain through the hole in the knife. Still, for the price, it's a pretty cool karambit.